Pallet delivery to Denmark has never been as simple or as cost effective as it is with National Pallets. We offer a fast and efficient service at competitive prices to all the main cities and principalities in Denmark. We provide a 2-day premium service and a 3-day economy service, dependent on how quickly you require your pallet. The process is treated in exactly the same way as a pallet delivery within the UK with no extra shipping documentation required or customs charges to pay. You just place the order with us and let us handle the rest. Denmark is a Scandinavian sovereign state in Northern Europe and they have one of the most competitive economies in the world. They have been very influential in the shipping industry with the design of the largest and most energy efficient container ships in the world and as a result their export and import traffic has increased significantly. Using our state of the art tracking facility, you can track your pallet all the way to Denmark, from the moment it’s collected right up until its arrival. We will even notify you by email once the delivery has been made. By tracking your pallets, we can ensure that you always know where your pallet is and that it’s safe and secure in our hands. 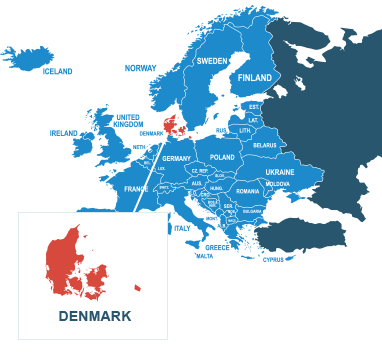 Why not request a free online instant quote now and see for yourself just how easy it is to send a pallet to Denmark today! Do I need to deal with customs when shipping a pallet from the UK to Denmark? No. As Denmark is a member of the European Union, you don’t need to worry about dealing with international customs and extra charges when shipping your pallet. How much does it cost to send a pallet from the UK to Denmark? You can send a standard quarter pallet (up to 250kg) for as little as £154.30 ex VAT. For more information on pallet prices and dimensions, click here to get an instant online quote. Orders must be placed before 11am if importing or exporting to Denmark to qualify for quoted time scales. Standard delivery time is 6 days; however, express 4-day services are also available. We are able to ship the majority of goods to and from Denmark, however there are some exclusions, these are listed below. *Orders must be placed before 11 am if importing or exporting to Denmark to qualify for quoted time scales. Prices quoted are based on quarter size pallet with economy options selected. Delivery & collection prices subject to VAT.